For more than 30 years the mantra behind economic policy making has been free markets good, government intervention bad. With no end in sight to the banking system crisis and many economies in freefall, policy makers are thinking afresh. For inspiration some of them have turned to the late John Maynard Keynes, the British economist who is widely credited with providing solutions for the last great slump, the Great Depression of the 1930s. Governments around the world are spending trillions of dollars on financial packages to stop banks collapsing. They have also introduced fiscal and monetary measures to revive economic activity, such as tax cuts, increases in state spending on public works and huge reductions in interest rates. 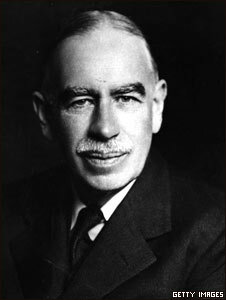 Mr Keynes believed that governments, not unfettered markets, hold the key to lifting economies out of depression. He thought the usual financial players in a capitalist economy - banks, private investors, stock markets - were by their nature short sighted, fickle and prone to panic. He felt that they could not be relied on to keep the wheels of commerce moving in hard times. "Keynes recognised that the economy is not inherently stable," says economist Roger Bootle, founder of the London-based consultancy Capital Economics. Mr Bootle says that Mr Keynes believed it was up to governments to rescue the economy with higher spending financed by borrowing money. "It can get stuck in recession which the private sector left to its own devices simply can't dig its way out of," he added. Another of Mr Keynes' insights is what the man himself described as the "paradox of thrift". The natural tendency of individuals and businesses when confronted with difficult times is to cut their spending and increase their savings. However, what is rational for an individual does not make sense for the whole economy. If everyone cuts back at the same time, Keynes pointed out, an already bad economic situation gets a lot worse. What is needed in a depression is not more saving but more spending. That in his view was another reason why governments should throw normal prudence and caution to the winds by splashing out with borrowed money when times are tough. The great depression of the 1930s did wonders for Mr Keynes' personal finances. It is often forgotten that he was an active investor on his own account as well as being an economic theorist and advisor to governments. "A lot of his understanding about how markets work and the forces of mania and panics that seize them were based on his own experience," says Lord Robert Skidelski, author of the definitive biography on Keynes. "He bought into the market very near the bottom of the stock exchange crash in 1931." Mr Keynes bought when everyone else was selling and as result became rich as the market recovered over the course of the decade. It was not until the outbreak of the Second World War that governments took his intellectual ideas seriously. During the war the British government and some others used deficit financing and other Keynesian methods to ramp up armament production and generally reflate their depression-scarred economies. His ideas dominated economic policy making in the Western world for a generation after 1945 but as immediate post-war reconstruction gave way to rising prosperity, doubts began to mount. Some economists questioned whether a framework developed to tackle mass unemployment and deep depression was appropriate to a radically different era characterised by rapid growth and plentiful jobs where the problems were different. In good times, Mr Keynes's critics argued, government intervention in the economy backed by borrowing does more harm than good as the stimulus it gives is unnecessary and the main result is rising prices. Inflation resurfaced as major problem in the late 1960s and Mr Keynes was toppled from his pedestal, even though supporters argued the reason for higher prices was not Mr Keynes but the effects of the Vietnam War. Mr Keynes was deposed by an intellectual counter revolution led by Milton Friedman and other economists of the Chicago school. Whereas Mr Keynes stressed the inherent riskiness of capitalism and the role of government in economic management, they thought the opposite. Backed by complex mathematical models, they believed the path to economic growth and efficiency lay in letting the free market rip, with minimal interference from the state. "In the 1970s it became respectable to model the economy as if it was a perfectly functioning, self-regulating machine," says Edmund Phelps, a Nobel Prize winning Professor of Economics at Columbia University in New York. "If you look at the market economy that way, there is really not much for governments to do." However, the problem is that markets do not always get it right. Arguably, over the last 18 months the credit crunch has cruelly exposed the risks of leaving markets to their own devices. What began as a financial market and banking crisis has become a global downturn and the pendulum of economic opinion has swung back towards Keynesian style thinking. Mr Bootle argues that businesses now expect and rely on governments coming up with Keynesian measures to revive the economy. "If we had a whiff of a return to pre-Keynesian finance we could end up with a crisis that mirrors the scale of the great depression," he says. Analysis is broadcast on BBC World Service Monday to Friday at 0141 GMT, 0541 GMT, 0850 GMT, 1141 GMT, 1350 GMT and 2220 GMT. 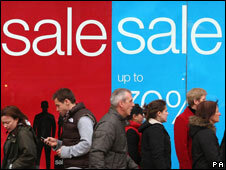 You can also listen to Analysis on BBC World Service online.